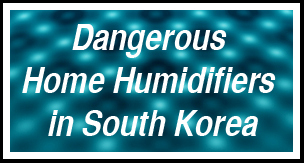 According to a recent study from Seoul, South Korea by Kim et al, disinfectants in home humidifiers are the cause of 28 cases of lung injuries. Many patients were pregnant or recently had children. 4 patients required lung transplants. The disinfectants were probably used to avoid fungal growth in the machinery, but instead resulted in injuries for consumers. Alex Alexiev is a recent UC Davis graduate with a BS in microbiology working in Jonathan Eisenâ€™s lab on aquariums as part of the microbiology of the built environment. Oh, that’s really scary! to think that ordinary household appliances can bring such danger! DU Park et al., Estimating retrospective exposure of household humidifier disinfectants, Indoor Air 25, 631, 2015. A terrible situation, I hope that will never happen again! By the way, I wanted to pay attention to the possible consequences. I for that to be cautious during pregnancy, (And for kids) I recommend everything. But it depends on the method of using essential oil. Many people use heating and evaporation, and here it’s important to know what the capacity is made from. Some people are looking only for bpa free oil diffuser. I will trying to find more reviews of home appliances, so I could figure out what would work best for my family.